This Sunday, the Modi Sarkar completes 1,091 days in office, and three years on May 26. This week, the government will be assessed for what it promised and what it has delivered as yet. This Sunday, the Modi Sarkar completes 1,091 days in office, and three years on May 26. This week, the government will be assessed for what it promised and what it has delivered as yet. Its biggest miss, an opportunity messed up, is the relegation of the grand idea of 100 new cities into a routine programme. The messed up opportunity needs to be viewed in the context of the challenges faced by the government—to create 10 million jobs a year, catalyse consumption, prime investment, boost affordable housing and improve human development indicators, and promote social inclusion. “Our cities should no longer remain a reflection of poverty and bottlenecks. Rather, they should become symbols of efficiency, speed and scale. We will look at urbanisation as an Opportunity rather than a Threat. We will initiate building 100 new cities; enabled with the latest in technology and infrastructure—adhering to concepts such as sustainability, walk to work etc, and focused on specialised domains.” This is what the BJP’s Election Manifesto 2014 released on March 26 that year said. All very laudable but the moot question is how this fulfils the promise to build new cities? How many of the cities pass the ‘liveability’ test? Take three parameters—air, water and transport. Has there been any progress on quality of air? Pune, deemed smart city, is hostage to tanker mafia, especially in the newly developed areas. Despite availability and affordability, cities are wracked by outages—thanks to the penurious state of SEBs. Mass transport system is either yet to be or, like in Mumbai, crumbling. Mind you, already 400 million of the 1,250 million live in urban India, and every decade over 90 million are added to the urban populace and would touch 500 million by 2022 when India overtakes China in size of population. Over 65 million people, roughly the population of France, live in slums and shanties in India’s urban landscape—in Mumbai 7.5 million persons, the population of Hong Kong, live in slums. Urbanisation, it is widely acknowledged, is a force multiplier. In 2000, China had 58 cities with a million plus population, by 2016, depending on which database or source one consults, the country had over 100 cities with million plus population. In comparison, India has 55. In 2015, Hangzhou became the 10th city in China with a trillion yuan GDP (approx $145 bn). Shanghai tops the list with a GDP of $375 billion—indeed, over 35 cities in China boast of a per capita income of $10,000-plus. Fact is, urbanisation enables opportunities that propel efficiency and competition and widen labour markets. This contributes to growth. It provides a basis for low-skill, low-wage farm labour to acquire skills, better incomes and shift orbit. Creation of new habitats also drives investment, job creation, consumption and, importantly, improvement in health and education when new facilities are spawned. The immediate imperative before the government when it released the 2014 Manifesto was to create jobs. It promised to end “10 years of jobless growth” by promoting investment in labour-intensive manufacturing, in tourism and in entrepreneurship. Projects for new cities would have enabled this. Nearly 50 per cent of the workforce of 450 million is dependent on agriculture, and jobs in construction and infrastructure are natural bridges moving low productivity farm labour to higher productivity jobs. Growth in construction also has the widest impact across 200 sectors. It will also enable affordable housing that Modi government has been struggling to push. 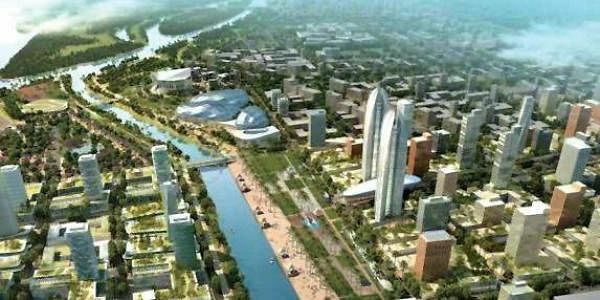 Of course, the Atal Mission for Rejuvenation and Urban Transformation (AMRUT) is essential. Sure, the states have been catalysed to assess the state of local governance—and 100 odd cities have been ranked across states. The question is, whether the blend incrementalism can deliver amidst the inadequacy of capacity and funds? More pertinently, why shelve the idea of new cities? The argument is not why smart cities—the question is why the either or stance. It is true that land availability is an issue, but that is where imagination comes into play, in leveraging existing resources. Non-functional SEZs are sitting on over 27,029.77 hectares of land, that is roughly 270 sq km—an area larger than Kolkata. Defence establishments hold over 17.54 lakh acres, roughly 7,000 sq km. Must cantonments continue to be in the middle of cities so many years after 1857? Can the rotting estates of Ordnance Factories be reconfigured to create smaller, smarter new cities? How about mapping the government’s land bank? Mercifully, land availability did not thwart creation of Amaravati in Andhra Pradesh. Why not look at the land pooling model tried in Andhra Pradesh and elsewhere? India has 3,800 Census Towns—that peculiar Indian creation which symbolises unplanned ugly urbanisation. How about connecting contiguous towns and creating an urban constellation? Yes, it will require resources. The way out is for government to create an infrastructure grid and get private investment to pay their way and play their role. The BJP has propounded the need to create new cities for decades. Indeed, BJP’s 2012 “Vision 2025: Transforming India” document. It stated upfront: “India’s urbanisation cannot be accomplished with the stock of existing cities”, and listed the need to, “create 100 new cities” among ‘BJP’s 20 Big Ideas to Develop India’ as an imperative.